Deposits for the quarter totaled $996.7 billion, below a StreetAccount estimate of $1.009 trillion. Fixed income trading revenue came in at $3.08 billion, slightly under a forecast of $3.11 billion. Sales from consumer banking and institutional clients totaled $8.25 billion and $9.691 billion, respectively, representing growth of 2 percent and 3 percent. Citigroup shares fell Friday after the banking giant reported weaker-than-expected quarterly revenue. The company's earnings per share, however, topped estimates. The company's stock fell by 2.2 percent. Still, CEO Michael Corbat said in a statement that Citigroup "drove strong year-over-year revenue growth in many of our businesses – including our International Consumer franchise, Treasury and Trade Solutions, Equities, and the Private Bank. And we continue to support our clients as evidenced by solid loan growth that was balanced across businesses and geographies." The company also said its earnings per share grew by 27 percent on a year-over-year basis as net income rose 16 percent to $4.49 billion and as its shares outstanding decreased by 8 percent. Citigroup said the rise in net income was driven by a lower effective tax rate, which fell to 24 percent from 32 percent. Revenue rose nearly 2 percent from $18.155 billion. 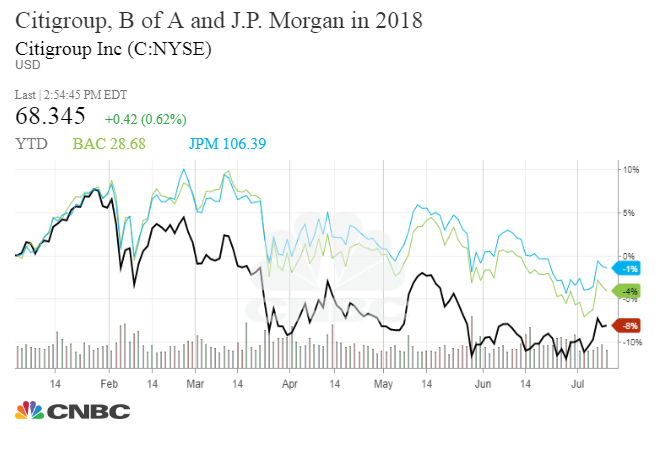 Shares of Citigroup were down more than 8 percent for the year heading into Friday’s report, lagging peers such as Bank of America and J.P. Morgan Chase. Bank of America and J.P. Morgan were down more than 2 percent and 0.8 percent, respectively. Citigroup announced in late June that it would hike its quarterly dividend by 13 cents to 45 cents a share, and buy back $17.6 billion in stock over the next 12 months after passing the Federal Reserve’s annual stress test. The bank reported better-than-expected earnings and revenue for the first quarter in April. Its results from that time period got a boost from lower corporate taxes and strong trading revenue. Earlier Friday, J.P. Morgan kicked off earnings season when it reported its second-quarter results. "In the shadow of rival JPMorgan, Citigroup’s results pale in comparison. The bank’s growth in earnings was almost entirely driven by a lower corporate tax rate, rather than Citi’s underlying operations. Citigroup’s revenue growth was tepid at only 2%," said Octavio Marenzi, CEO of capital markets management consultancy Opimas. "While expenses also declined in line with revenues, Citi will have to continue to pay close attention to expense management in the coming quarters." Correction: An earlier version of this story misstated the corporate lending revenue figure. Citigroup CEO Michael Corbat will be on CNBC's "Closing Bell" on Monday at 3 p.m. ET. — CNBC's Hugh Son contributed to this report.